Not quite four years ago, Fresno-area farm equipment salesman Steve Malanca got fed up that so many Californians – even those living in farm country – don’t understand how important agriculture is to the Golden State’s economy. So he created a decal that people could use to let the world know, featuring an outline of California and simply stating, “My job depends on Ag.” To date, he’s sold 90,000 of the decals, which are now proudly affixed to bumpers and store windows around the state. To spread the word, Malanca’s friend and customer Erik Wilson created a Facebook page which now has 85,000 likes from people around the world. Now Malanca wants to take to the air and send an airplane that displays lighted messages over cities including Sacramento and Fresno at night. To help provide funding for this effort – and to expand a program that provides $500 scholarships to high school graduates planning on majoring in agriculture – Malanca has organized the On the Rise With Ag fund-raising dinner for Saturday, December 8, at Fresno-Yosemite International Airport, at which he hopes to raise $50,000 to promote the cause. The event – sponsored by CoBank, Farm Credit West, Fresno Madera Farm Credit, Golden State Farm Credit, and Yosemite Farm Credit– will take place from 5-11 p.m. at the Ross Aviation hanger and features a wine hospitality hour, a dinner and a live auction. The evening will conclude with casino games in which participants can win chips that can be used to obtain valuable prizes. “Agriculture is a huge part of the state’s economy, but too many people only look at the value of crops and not all the jobs and businesses that support farmers and ranchers and make ag possible – everything from farm equipment to Farm Credit,” said Leili Ghazi, president of Farm Credit System member CoBank’s Western Region Agribusiness Banking Group. 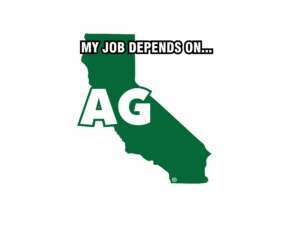 The event is also sponsored by Nutrien Ag Solutions, Horizon Nut Co., Dairy Farmers of America, Fresno Equipment Co., Netafim, and TechnoFlo. Malanca said it is hard to believe there are people in farm country who have seen the decal and asked what “ag” is. “One smarty-pants kid even asked if it was the periodic table symbol for silver,” he said.